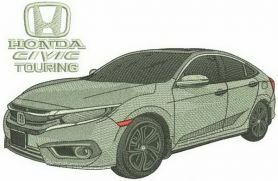 The design perfectly suits the owner of the Honda Civic Touring car to create seat covers or topical items. Design dense use only the appropriate fabric. It is also necessary to use a stabilizer with parameters not lower than 80-100 grams per m2. Embroidery design is completely ready for transfer to the embroidery machine.